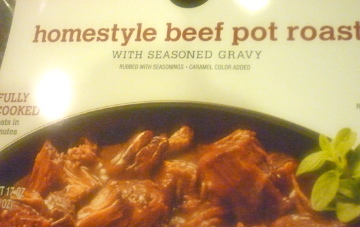 Ya know how you love the rich, deep flavor of pot roast? After you've finished that fabulous, comfort food dinner, what will you do with that pound of leftover meat? Have it again? Okay. Make barbecue beef sandwiches? Okay... yum. But look what Publix Supermarkets suggests that you try. 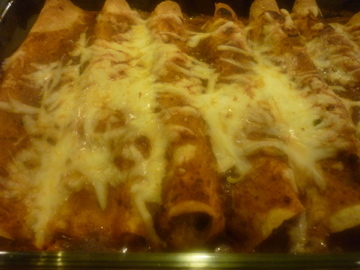 Southwest Beef and Black Bean Enchiladas. I just love the Aprons people. They consistently come up with simple, delicious recipes that are quick and easy. You can use leftover pot roast or if you're running behind on your dinner preparation like I was, you can purchase a 17 oz. package of fully cooked beef pot roast. Most food stores carry one brand or another. The Publix brand pot roast cost me around four dollars. At five o'clock in the afternoon, that seemed like a great deal! Amazingly, I had everything else at home but the tortillas. I changed it just a little. If you need to see the original recipe, click here. The salsa verde I used is already a little spicy, so I omitted the green chilies and added half a can of corn. They also instructed you to fill the shells with all ingredients separate... You know: layer of meat, then beans, then cheese, then chilies, then roll it up. That was too slow for me, so I mixed all of the filling ingredients together first. 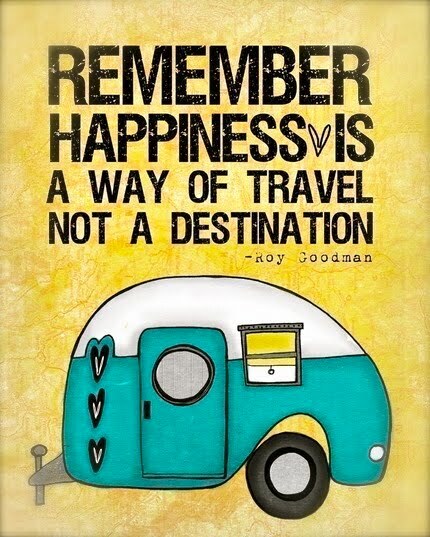 Much easier! Preheat oven to 400 degrees. Microwave pot roast for 2 minutes on medium to warm. Drain gravy into a small saucepan. Add tomato sauce and the salsa verde to the gravy. Cook for about five minutes, or until hot. Meanwhile, shred beef into a large bowl. Toss in drained black beans, corn and half of the cheese. blend with a fork, then add 1/2 cup of gravy-sauce to meat mixture. Blend well. Take 1/2 cup of gravy mixture and pour it into the bottom of a 9x13 baking dish. Take a tortilla and fill with meat mixture. Place it seam side down in dish and repeat until you run out of filling. The package I bought contained ten. I used eight of them. Pour remaining gravy over and sprinkle with remaining cheese. Bake for 15 minutes. 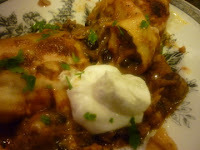 Top with fresh cilantro leaves and serve with diced tomatoes and a dollop of sour cream.